I actually got sunburned the other day and it made me realise that summer is approaching fast, so I decided that I needed some highlights in my life! I've been getting a bit bored with the medium shade I've been dying my hair (a colour I've fondly nicknamed 'manky blonde') so thought some highlights would perk the colour up a bit and give that summery sunkissed look (now all I need is a tan and a tropical holiday- I can dream!) Jerome Russell bleaching kits have always been my weapons of choice when it comes to bleaching my hair, I find that unlike most box bleaches they lift the hair enough and work even on dark hair. Here's how I achieved my highlights! First step is to comb through your hair and put on the cap, if you've never worn one of these before you'll definitely have a bit of a laugh looking at yourself in the mirror. Not the most flattering of head gear; you might have noticed in the pictures above I've cropped out most of my face just because I really did look that awful! This is probably the trickiest part, basically you're aiming to pull out pieces of hair through the X's on the cap. In the pack is a little hair pokey tool with a hook on the end (very technical description I know) which you poke through the X and pull out a few strands of hair. I forgot to include this in the picture so improvised with a black line, I'm sure you get the gist. I used two mirrors to see what I was doing at the back of my head, which wasn't exactly easy but still do-able if you're on your own with noone else to help. When you reach the stage of looking like a demented bald barbie, you know you've pulled enough hair out. The more hair you pull out of the cap the more highlights you will have which is great because you can control how light the final result will be. Then it's just a case of applying the bleach, simply mix together the bleach powder and developer and paint onto the hair starting from the hairline. Once you're done, cover with the developer cap. 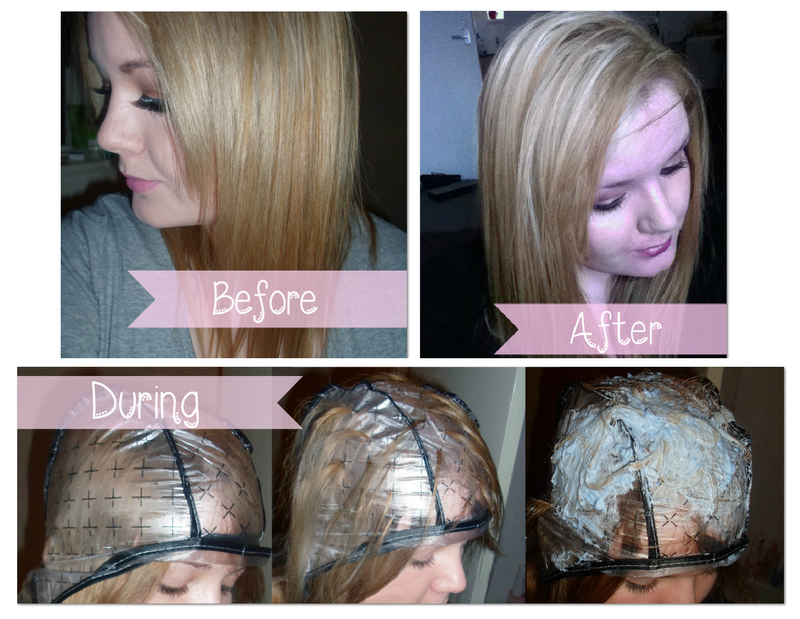 The development time is anywhere between 15 and 90 minutes, this depends on the original colour of your hair. There are instructions in the pack so it's easy to work out, plus you can check on the colour every ten minutes to see how well it's lifting. I left mine on for around twenty minutes, my hair has already been previously bleached so I think this was about the perfect amount of time for me. The instructions say to remove the cap and then rinse your hair, I did it the other way around (what a rebel) and rinsed as much of the bleach out as possible and then removed the cap so I don't think it really matters either way. This highlighting kit lifted my hair colour nicely and I'm really happy with the results, I think it's brightened up my hair quite a lot what do you think? 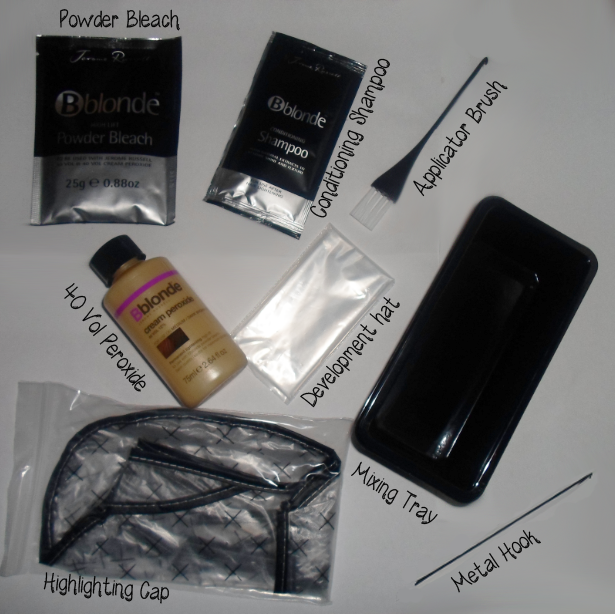 This kit can be used on both light and dark hair which should work for just about anyone, but be aware here that using any kind of bleach over previously dyed hair- especially if it's been dyed dark- is unpredictable and could land you any shade of orange or yellow (been there, done that, got the tshirt ten times over). If your hair has been dyed your safest bet is always do a strand test first so you have some idea of the colour you'll end up with. Jerome Russell have loads of different bleaching kits available and can be found anywhere you'd buy hair dye from including Boots, Superdrug and eBay . 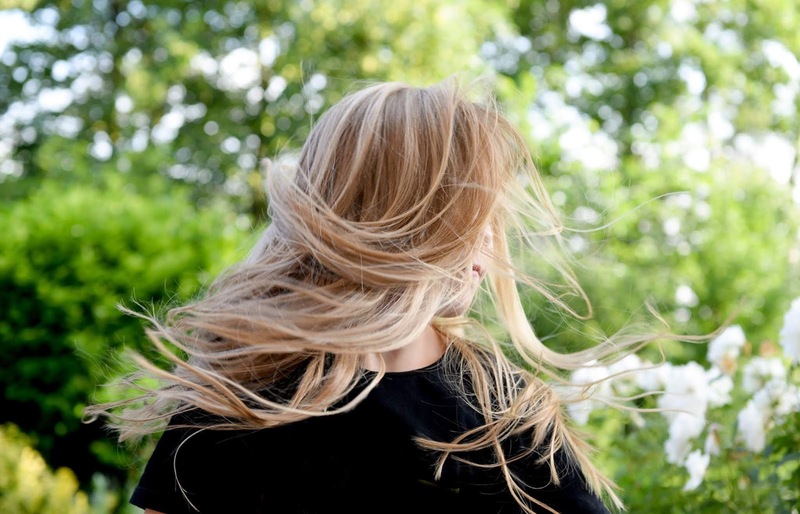 Will you be highlighting your hair this year? Wow! I think it's awesome that you went for it and DIY! Looks great! New follower from Aloha! Hope you follow bck! I'm stopping by from the Fun Friday blog hop and started following on GFC. Your highlights look really well done! Thats really helpful!! I alredy bought my highlighting kit from this brand!! loved your blog!! I will follow you for sure! I also live in England and write a blog, I am brazilian and start writting to be in contact with family and share news and products with them! !